If you read my blog post a few days ago about wanting to get my hair in good condition, then you'll know that I'm starting to focus my attention on any hair products that will help me in my quest! I received a tube of the TRESemme Keratin Smooth Concentrated Rinse Off Treatment in a GlossyBox recently and decided to test it out for myself. 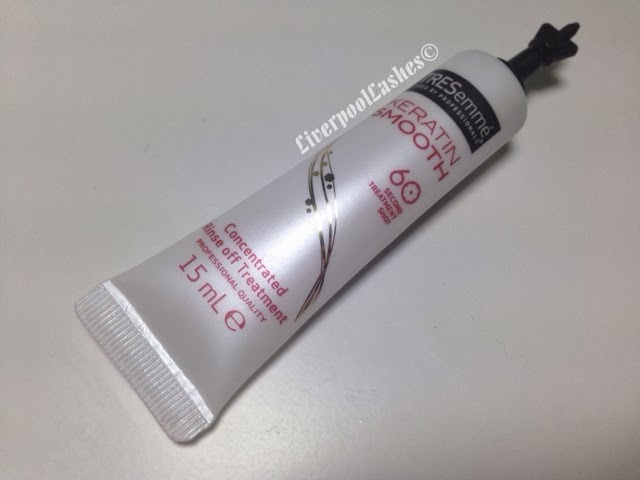 At 15ml, this is a full sized product designed to give a 60 second treatment shot. Once I had shampooed my hair I then moved towards the application. For some reason I expected it to be an oil, like those VO5 hot oils that you used to buy years ago but it was actually a white thick conditioner style formula. I happily discovered that my mid length hair can get away with two applications out of the tube and it smelt pleasant and very 'salon-like.' Once my hair was blown dry I could definitely feel the moisture boost it had given me. The bottom line is... I really enjoyed this little hair treat. At £1.49 per tube it's affordable for an occasional treat, bearing in mind that most hair masks are more on the pricey side. I would highly recommend to pick this one up and try out for yourself for sleek, smooth hair.